Urquhart Castle, a dramatic attraction which overlooks the water of Loch Ness, is surrounded by some of Scotland's most stunning Highland scenery. 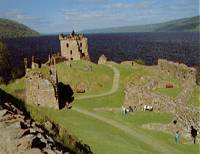 Once one of Scotland's largest castles, Urquhart has a fascinating history. The castle's history is told in an exhibition and audio-visual display in the superb visitor centre, where medieval artefacts discovered on site are also on show. Visitors to the castle can see the five-storey Grant Tower, which once provided accommodation for the lords and their families. The tower gives magnificent views of Loch Ness. There are also remains of kitchens, the gatehouse, cellars and other buildings which provided for the lord's comforts and protection. Urquhart Castle has a long and bloody history stretching back to the 13th century when the area was granted to the powerful Durward family. Following Edward I's invasion, it fell into English hands and was then reclaimed and lost again. The castle figured in the Scottish struggle for independence and came under the control of Robert the Bruce after he became King of Scots. In addition to the display of artefacts, an audio-visual presentation, available in six languages, condenses the castle's turbulent history into a dramatic short film. The shop is stocked with a wide range of gifts, books, food, drink and jewellery, as well as a range of local crafts made in the Highlands. The cafe offers a menu which includes home baking and a selection of hot and cold snacks. Picnic packs are also available for those wishing to eat outside in fine weather. The centre is fully accessible, with sound loop facilities. Two motorised disability buggies are available on request. On Loch Ness, near Drumnadrochit on the A82.